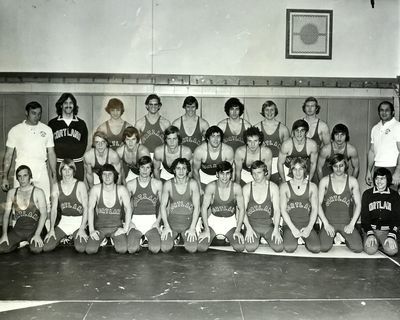 Varsity wrestling team. First row: Doug Casey, Dean Brown, Pat Hickey, Paul Thompson, Larry Bryant, Dom Scolaro, Fred Kiesecker, Dan Mazzelli, Fred Zimmerman, Bob Lee (Manager). Second row: Jerry Casciani (Asst. Coach), Jim Lomonaco, Jerry Graf, Joe Burnholz, Vin Ruggerio, Tom Roche, Bob DaRin, Roger Brown, Vince Gonino (Head Coach). Third row: Bob Tryka (Manager), Jim DeMidio, Tom Stein, Russ Hohlman, Greg Zimei, Scott Guild, Dennis Simmons.